With its 183-unit victory in May 2013, the BMW 3-Series expanded its lead over the Mercedes-Benz C-Class to 1302 units through five months. The 3-Series is Canada’s best-selling premium brand vehicle. From a moneys-spent perspective, a perspective which certainly counts for something, the 3er’s base price ($35,900) makes many a 320i sale no more premium than the sale of a Ford Escape Titanium. “Premium” and “luxury” mean different things to different people. This is why GoodCarBadCar publishes lists for all cars, all SUVs and crossovers, all trucks, and all minivans, and then throws them all into one post. Those lists will be completed later this week or early next week, and they can be used by you to form your own best-selling luxury lists. Include the Hyundai Genesis sedan, for example, and exclude the Acura ILX. To satisfy as many readers as possible, GoodCarBadCar completes the list of 15 best-selling premium brand vehicles first, and then below posts another list of vehicles with base prices of at least $50,000. 10 of those 15 expensive vehicles are utility vehicles. The first list, meanwhile, is made up of nine crossovers, including the increasingly less popular BMW X1. Which sells slightly more often than the Cadillac ATS. 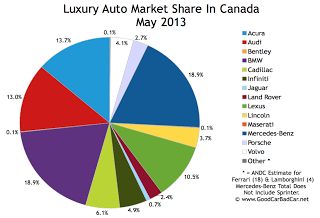 Canada’s interest in Cadillac and Lincoln is, at best, measurable. May 2013 luxury market share for Cadillac was 6.1%; Lincoln held just 3.7%. Those figures can be compared with the accomplishments of Cadillac and Lincoln in the United States: 9.5% and 5%, respectively. Historical monthly and yearly sales figures for any of these models can always be accessed through the dropdown menu at GCBC’s Sales Stats page, and for those not viewing the mobile version of this site, near the top right of this page, as well. Canada’s favourite luxury vehicles are listed below, but you can see Canada’s 30 overall favourites here. For the purposes of the above list, premium brands include Acura, Audi, BMW, Cadillac, Infiniti, Jaguar, Land Rover, Lexus, Lincoln, Mercedes-Benz, Porsche, and Volvo. Brands like Aston Martin, Ferrari, Lamborghini, and Lotus don’t report specific monthly sales data. Bentley and Maserati only report brand totals. GCBC opinions and overwhelming reader input tossed Buick back in with the mainstream wolves. $50,000 CDN (before delivery) is an arbitrary borderline, but if GCBC was to follow this new system of designating only expensive vehicles as luxury vehicles, $50K seemed like a safe place to begin – it equals the average U.S. new car transaction price plus $15,000, plus another $5000 to account for Canadian increases. 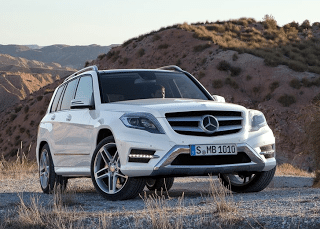 Plenty of less expensive vehicles with specific models feature prices above $50,000 – M, RS, and AMG models come to mind, specifically – but in the case of this list, we know that none of the registrations were of cars priced at $35,900, as would be the case with the BMW 320i, which costs less than a Hyundai Santa Fe 2.0T Limited. The biggest problem with a $50,000 minimum price of entry? Cars like the Cadillac XTS, which starts at $48,995, sporty cars like the $48,600 Audi TT, and SUVs like the $49,930 Chevrolet Tahoe and $49,675 Volkswagen Touareg. * With the new Acura MDX, set to arrive in July, Acura Canada will be dropping the base price below $50K.